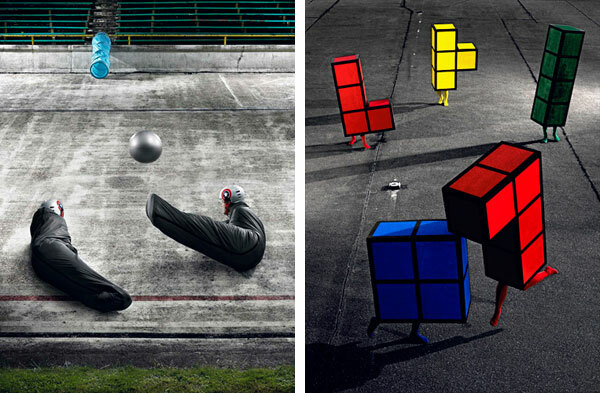 An assembly of Tetris shapes as opposed to an assemblage, there is nothing sexually alluring about these photographs. Despite what Lana Del Rey may have you believe there is absolutely nothing reproductive about video games — although Pacman may be debatable. 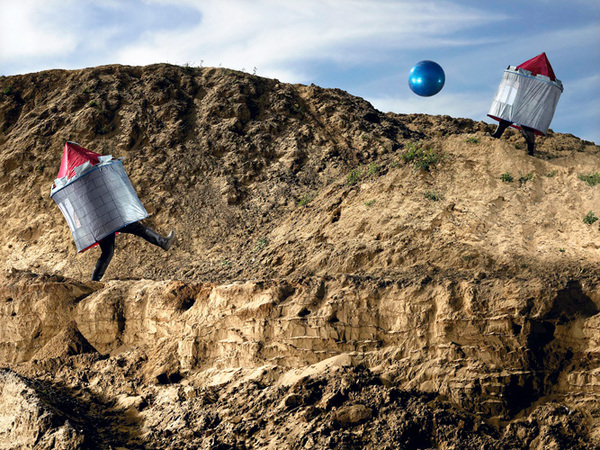 Hamburg-based Patrick Runte has created a new series of photographs called Jump N’ Run. 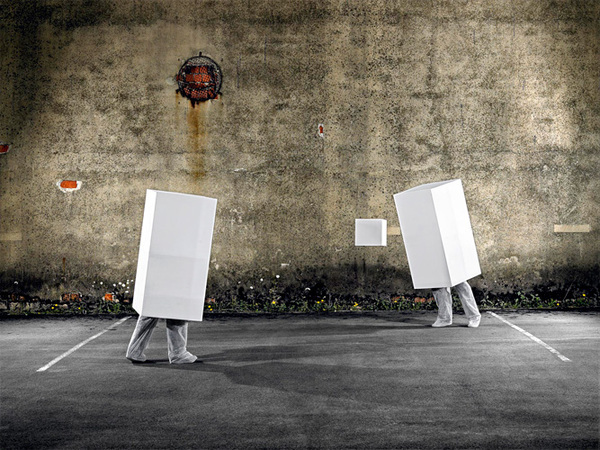 They are highly stylized and ‘platformalized’ photographs that pay tribute to the origin of the trend toward inhumanity… or at least to an episode of Takeshi’s Castle. 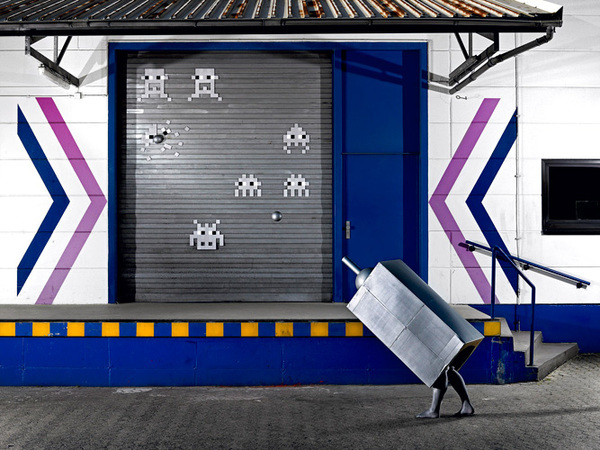 Lady Gaga acts out and monetizes this trend in real life, but while Lady Gaga offers a menu of fantastically packaged individuality Runte’s photographic series rather obscures individuality in homage to the video game Holy Cannon from Pong to Space Invaders to Ballerburg. The Oskar Schlemmer allusion is obvious: and it makes sense that while Schlemmer concealed his dancers with geometric shapes in the Triadic Ballet Runte now obfuscates the subjects of his photographs with video game character costumes. This is a reflection of the childlike yet complex shift the modern world of design has taken. Oskar Schlemmer thought that the movement of puppets was aesthetically superior to that of humans. Patrick Runte in his own words, “wanted to compile old video games… and make them be able to be experienced by the human body. 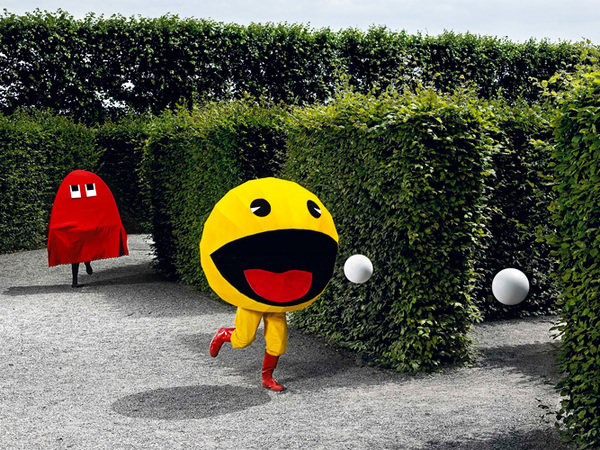 Videogames cannot be experienced…they only make you feel like you are doing stuff.” But is dressing up and reenacting Pacman more fun than playing Pacman? Someone should conduct a scientific experiment about this. Runte says he’s also influenced by the term “streetplay.” I can’t find a definition of “streetplay” anywhere on the Internet, but was able to find it as a synonym for the word “summerawly” which is street-talk for neighboorhood “street playing”, like stick ball or skating. Summerawly sounds pretty fun and like something we all want to be a part of, so consider Runte’s photographs the beginning of the get-out of the bedroom and get-into the streets movement however un-aesthetically pleasing (and absurd) that may turn out to be. I think these photographs would be better off inverted — that is to have real humans in video game environments, because in Runte’s photographs the dressed up characters look out of shape and lumpy like pillars of lethargy. The costumes are quite well done however and I hope he gets some VIP action at E3. Runte erases the notion of fact vs. fiction because those things just aren’t important in video games. Runte’s photographs are slightly l’eau du Greek Tragedy. After all which is more important: the ego’s desire for immortality or the innate monstrosity of homo sapien?